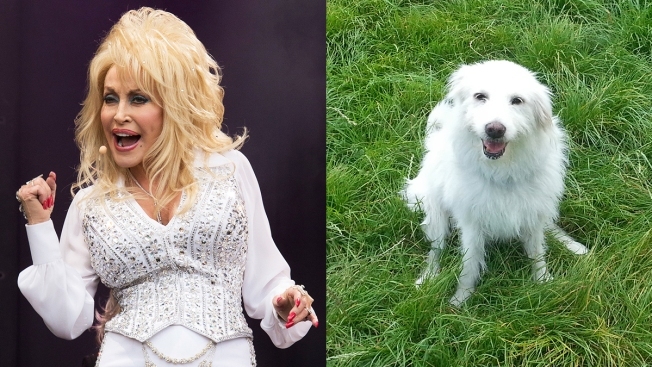 "Dolly" the dog was abandoned after the country music legend's performance at the Glastonbury festival last month. The lurcher, which has fluffy white hair, was seemingly left behind after the 150,000 revelers decamped the site in the southwest of England. Parton has pledged to adopt the dog if its owners don't come forward soon. Animal shelter workers named the dog in the singer's honor. Dolly is being treated for an ear infection at the Happy Landings animal shelter, which is near the festival site and is appealing for donations. The shelter says in a statement that Dolly — the dog, that is — is a "sweet-natured older lady" and that it is waiting for her owner to come forward.